Gardening Vacation 2007 - Monday. I decided this morning that I needed a break from planting, after re-doing the hosta bed yesterday. Instead, I thought I would relax by going plant shopping! As everyone knows, running around in the spring to buy plants for containers and annuals can take a lot of time. There is no single garden center or nursery or big box store that has everything you want and need. Today I went to three independents and three big boxes with a friend of mine who relies on me to help her buy her plants each spring. I'm off to a good start, but nowhere near done. My friend, on the other hand, has most all the plants she wants. 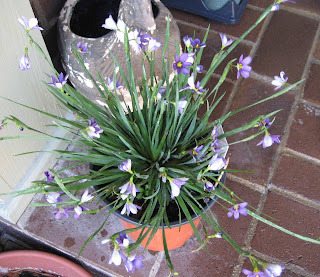 The little blue flower above is a close up of Bermuda Blue-Eyed Grass, Sisyrinchium bermudianum, that I bought at one garden center. And here's the whole plant. I challenge anyone to pass this plant up. The tag didn't list the hardiness zone, so I looked it up when I got home. My searches were inconclusive. It could be hardy to only zone 6 or it could be hardy in zone 5 (my zone) or even zone 4. I'll just give it some extra winter projection and hope for the best. Some would say that this plant wasn't a smart purchase, not knowing what the hardiness zone was. Did you know you can't assume when you buy a perennial in a zone 5 garden center that it is hardy to zone 5? And I'm not talking just about buying from big box stores who sometimes sell plants here from the south *gasp* that might not survive our winters. I'm talking about buying from garden centers where the staff should know better. One shopping tip I give people who ask is don't buy a tree or shrub in the spring that is more leafed out than the trees and shrubs already growing around here. To me, that's a sign it was brought in from a southern state, and while it is probably hardy here, it might not be. I know, that tip only works when you shop early for trees and shrubs. But I also have no problem asking the garden center where their trees and shrubs came from and if they came from too far south, I don't buy them. Too far south for me is Tennessee and points south of that. I think I'll be okay with this perennial, I would have bought it even as a container plant. But it is "buyer beware" when buying a perennial that doesn't include the hardiness zone information on the tag. Now how about this purchase? Was it a smart purchase? I say Yes. This is a dwarf iris, variety 'Smart'. Hardy to zone 3! Both it and the Blue-Eyed Grass are going in my replanted perennial bed where I can keep an eye on them. They'll add some much needed early color there, because there are no other early bloomers in that bed, other than some columbine. 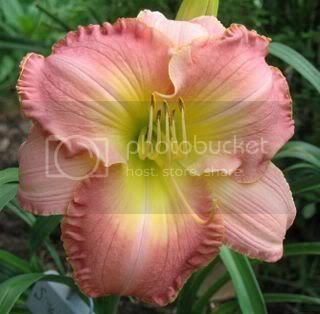 They will also stay fairly small and well-behaved, which is a requirement for being planted in that flower bed. I have another flower bed for the perennials that spread and self-sow. By the way, I did not intend to buy perennials today, but I ended up with four. I really was after container plants, really I was. But this was my first plant shopping trip of the season and I had been good all spring about not buying plants too soon and I had the new perennial bed with some open spots and you all know how you can get all confused at the garden centers especially ones where the plants all look well-tended and loved and practically scream out "buy me" and my shopping list was in my head not written down and the sun was shining and did I mention it was my first day of plant shopping? Tomorrow, I should plant what I bought today to keep up and not end up with all these plants that I am trying to plant next Sunday. And I will plant a bunch early in the morning. But as soon as the garden centers open, I'll head out again, and this time I will get some container plants and annuals and I'll have a shopping list and a better plan. I will! Those are good looking plants. I know what you mean about the screaming plant of a well tended garden center. Buy Me! I'm a sucker for those types of plants. So many plants that I want, so little reason to buy them yet so much desire... I try to be good, really I do. I love that blue eyed grass, and you are right, they are irresistible. I bought three of them several days ago. I wonder if they can be over-wintered in the garage. I planted a blue-eyed grass last year down by the mail box. I did nothing special for it over the winter and it has come back, but is not blooming yet. My crepe myrtle did not do as wonderful this winter, although there is new growth at the very base of the plants, so all is not lost. I went plant shopping Saturday, Sunday and yesterday. I spent about 7 hours each of the last two days planting and will have mulch to spread when I get home today. I want to get it all done so I can enjoy it. This better not be a year we get a late frost. (If you still need homes for all those hostas you divided, I would love to have one or two. So many plants, so little time. Love those dwarf irisses, very pretty. 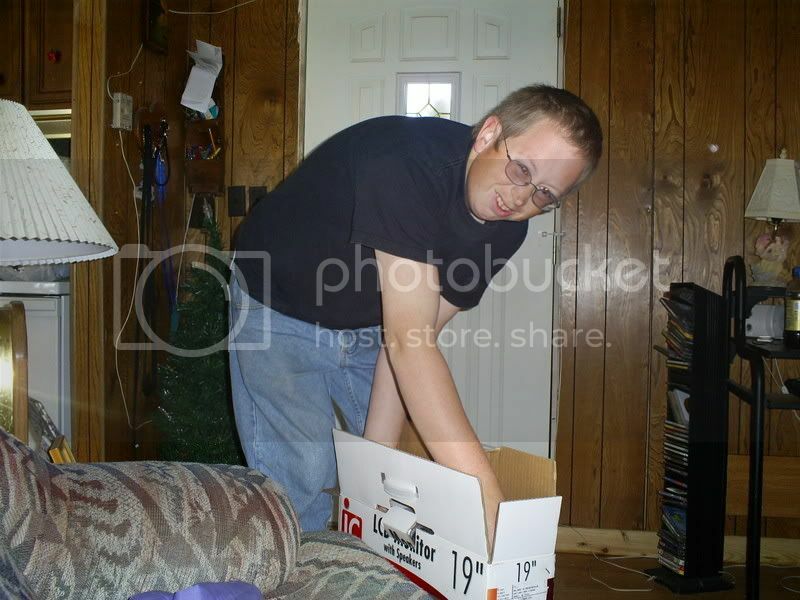 Don't you potentially have a microclimate by your front door where you are removing the shrubs? I know you bought the blue-eyed grass for the new bed, but it may survive in the better protected area. 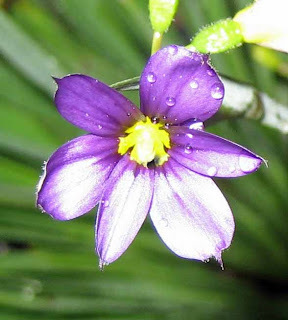 By the way, we have a native blue-eyed grass. The flowers aren't as showy though, but sometimes there is exceptional beauty in the delicacy. Some kind of tiny native Blue-eyed grass used to show up in my mom's yard, but I didn't realize there was one like this that we could buy...very nice Carol. The dwarf bearded iris are lots of fun and come in amazing color combinations. They're great for trading and as Passalongs. 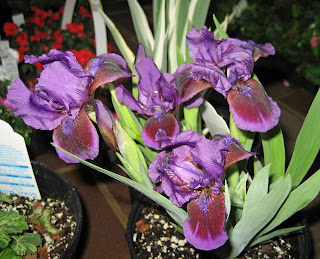 I had a couple dozen varieties at one time, many from Iris Society sales. So far you're having an interesting garden week! I have absolutely no will power when it comes to plants. It's just part of living the gardener's life! Thanks all for the comments. You all have been very helpful and encouraging as I have fun shopping and gardening this week! If you will permit me to be a bit lazy and not reply to each indvidual comment... I've got quite a lot to plant now! The new iris is just beautiful - what a gorgeous color! The blue-eyed grass looks awful familiar to me, and I need to check my notes - it might be something that I planted that didn't come back (and I never figured out why). It was irresistible though. The fun thing about all of these gardening blogs is to see what is out there, what works - and what doesn't - it's really an incredible amount of information all around. Hi Carol, I read that blue-eyed grass is related to the iris. We have had a couple of clumps in our yard, zone 6 for several years now and it keeps coming back year after year. One of the clumps is exposed to the winter winds and has not suffered for it. I even saw some tiny plants growing wild and blooming last year in a grassy spot near a water retention basin. I think this is a very tough plant that you don't have to baby much. Unfortunately ours which are light blue are not as gorgeous as the one you bought. I love the blue eyed grasses! I saw Wayside, I think, has a new one. I have one called "Quaint and Queer" and it is actually a brown flower...which sounds terrible, but is really rather cute...has done well and just yesterday put up with me digging up huge barberry by it (I hope). Anyway, enjoy! They're just so cute! 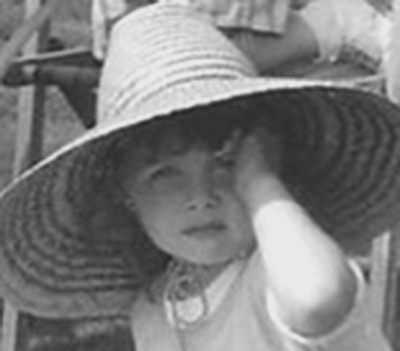 Have fun on your holiday!